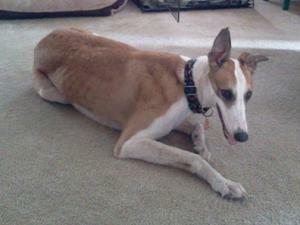 Tonya just arrived from the Sanford Orlando track in Florida. She also raced at Palm Beach and Gulf tracks and raced 112 races. She retired due to a broken toe. She is a friendly, sweet girl, so much so that she was a favorite of her trainer's in the kennel. Tonya raced at 63lbs and her sire is Team Record. Her dam is Silver Sloan. She turned 4 on January 12th. Tonya Passed her cat test at the track so should be fine to live with cats and small dogs. Tonya is doing great in foster care so much so that her foster home is considering keeping her. Tonya is staying at the vets to get her broken toe cared for.